A fresh parliamentary revolt may be underway in the Senate and House of Representatives. In 2015, the structure of the All Progressive Congress (APC) was shaken to its foundation, when former Kwara State Governor, Dr. Bukola Saraki, defied the party’s zoning arrangement, struck a deal with the People’s Democratic Party(PDP) and emerged the Senate President. Organic political analysts, have traced the loss of APC’s fortunes in the last 2019 general elections to Saraki’s political coup detat in 2015. It was the decline in what people think was the beginning of APC’s failure to whip its membership to line, that imbued confidence in other renegages, who coalesced with a plethora of other national factors, as the general elections approached to weaken the APC. Despite pulling the majority in the Senate and House of Representatives, the APC appears to be in dire straits in many states of the federation. And to worsen matters, fresh trouble is brewing in the Senate and the House of Representatives. Last week, in consultation with President Muhammadu Buhari, Comrade Adams Oshiomhole, the National Chairman of the APC announced afresh the party’s choice of Sen. Ahmad Lawan(Yobe-APC) and Hon. Femi Gbajabiamila(Lagos-APC), for Senate President and Speaker respectively. But another seasoned senator from the North-east, Sen. Mohammed Ali Ndume, thinks the choice of Lawan is hasty and unlawful, at least by party standards. He has therefore taken, as Saraki did earlier, the bumpy road to defiance. He insists he is the best person for the job, having been both House and Senate Leader at different times. The lawmaker from Borno State does not only think the party endorsed Lawan in error, he has gone ahead to lay out a nine-point agenda for his Senate Presidency and has threatened fire and brimstone, should the party “unjustifiably” rail against his ambition to grab the number three slot on the protocol list. The House of 360 lively members, is also not insulated from the turmoil. 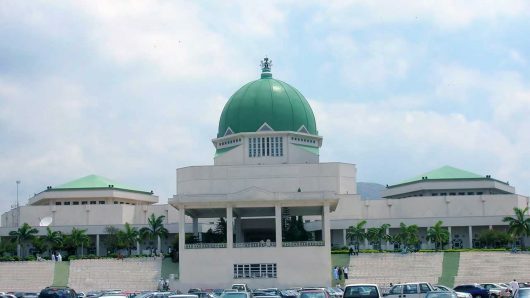 Investigations by our reporter suggest that the slot for the Speakership of the House of Representatives of the 9th Assembly, may be re-zoned to the North-Central, yielding to an avalanche of pleas from religious and regional interests across the country. The leadership of the All Progressives Congress(APC) had earlier zoned the speakership slot to the South-West, picking a cognate member from Lagos State, Hon. Femi Gbajabiamila to occupy the seat. The deal appeared to sit well with the members of the party who are in the majority, until last weekend, our correspondent learnt from a member of the House yesterday. APC so far occupies 211 seats, while the PDP shares the remainder of 149 seats with several other smaller parties. The choice of Mr. Gbajabiamila who has represented Surulere of Lagos State in the House of Representatives since 2003, appeared settled last week, but investigations by this newspapers have revealed that some chieftains of the Middle belt Forum and other North-Central groups, along with the Christian Association of Nigeria have since closed ranks to mount pressure on President Muhammadu Buhari and the Chairman of the governing APC, Comrade Adams Oshiomhole to recant their earlier support for Gbajabiamila, and instead throw the slot to the North-Central and preferably, a Christian. A member of the House in an interview with our correspondent , gave a list of issues with the choice of Gbajabiamila, including his style of leadership, the religious factor and the case for equity. “The choice of Gbajabiamila is a hard sale to us. Besides, his undemocratic nature, the issue of religious balancing is also major factor. “We don’t have issues with a Moslem Senate President, but that can’t be replicated in the House. It won’t be fair”, he submitted. Some of the lawmakers interested in the slot from the North-Central are Hon. John Dyegh(APC-Benue), Hon. Ahman Pategi(APC-Kwara), Hon. Ibrahim Wase(APC-Plateau). Dr. Dyegh, a three-term member of the House of Representatives from Benue State, said he will officially declare his interest on Monday next week. He said he joined the contest to occupy the seat of the Speaker of the House of Representatives “Because I’m not only highly qualified for the position, I am highly experienced, having been in the House since 2007. Dyegh will be the only APC member from Benue, when voting commences for principal officers in June. But he expects support from his fellow Benue and North-Central lawmakers who will be sworn in shortly before the election for Speaker and other principal officers. Ahman Pategi is another experienced member of the House from the North-Central. He has been in the House since 2007 and has chaired several committees, including the Committee on Water Resources. He also has the financial war chest and wide support across parties. Hon. Wase fron Plateau also has cognate experience, having also served since 2007. But if the party yields to the pressure of some groups and plays the religious balancing card, Dyegh may be favoured for the number four job. Nobody from the North-Central has ever held the position of Speaker since 1999. As the House of Representatives resumes plenary next week, it’s expected that the lobby to change the zoning arrangement for presiding officers will intensify. To avoid a repeat of the coup of 2015, the APC leadership, led by President Buhari, should call an emergency meeting first of contenders in both Chambers, with a view to reconciling differences. A broader meeting of all caucuses in both Chambers should also be summoned by the party, to press for the adoption of the choices that will be arrived at, after a thorough adherence to the principles of Federal Character and religious diversity.